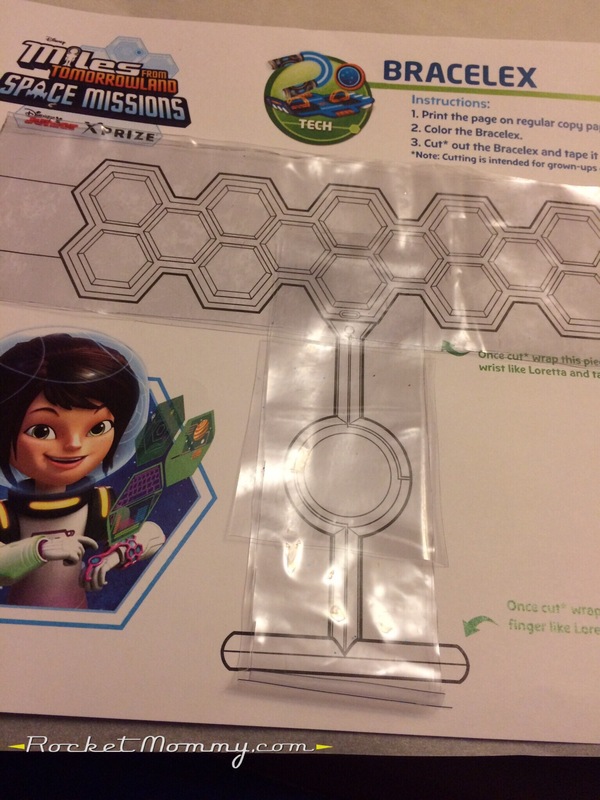 As I mentioned in my last post about the start of our DIY Miles From Tomorrowland family Halloween costumes, Disney did a great job of creating cool female characters for the show and then didn’t follow through with the marketing. They created lots of cool toys for Miles fans – his dating riddles , his Laserang , his Blastbuckle , his Blastboard – but they decided not to make Loretta’s Bracelex? Seriously, this would have been such a cool toy! So this (of course) means we have to make our own. 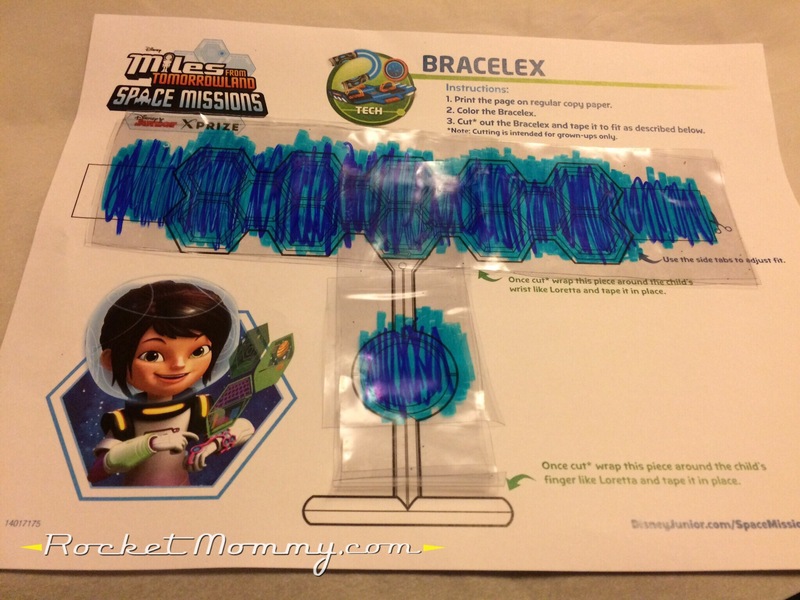 Lucky for us, Disney Junior’s website has this handy printable PDF Bracelex that we can use as a guide. Print a copy out, and let’s get started! 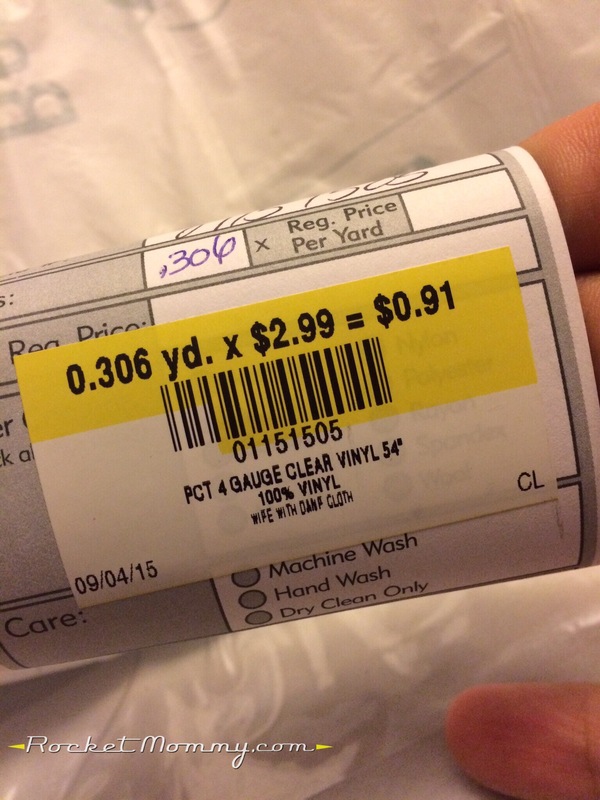 First, you need some of this stuff – it’s that clear vinyl that your grandmother probably used on top of her tablecloth. I was lucky enough to find a few pieces of it in the remnant bin, so this cost almost nothing. Cut a few strips of the vinyl (I did three layers) that are large enough to cover the Bracelex diagram on the printed PDF. You could do it all as one piece of vinyl – the finger and the wrist – but I did it as two instead so I wouldn’t waste as much of the material. If you’ve decided to do it in two pieces, you need to layer the vinyl in between the wrist pieces, making sure you have enough overlap to keep that joint strong. 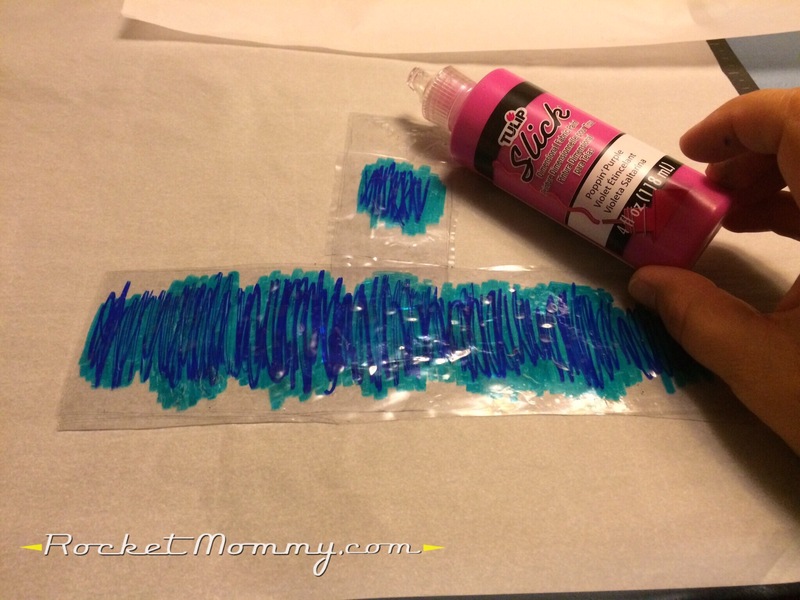 Grab a couple of Sharpies and color one of the inner layers of the vinyl. I used teal and royal blue and just scribbled on it a bit. 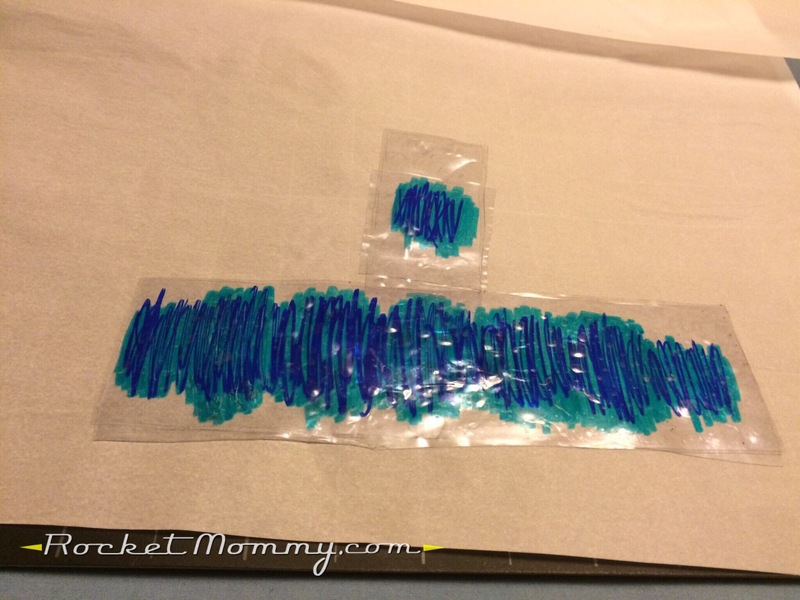 Then layer the top pieces of vinyl over the pieces that you colored so they’ll be sealed and protected. Now, grab two pieces of parchment paper. 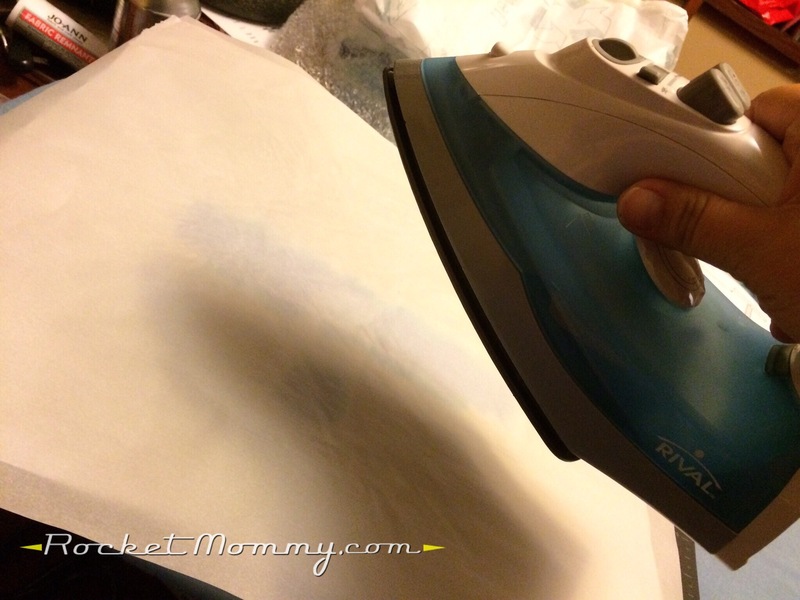 Slide your vinyl on the parchment, then put another piece of parchment on top, and iron it with a very hot iron for about a minute. 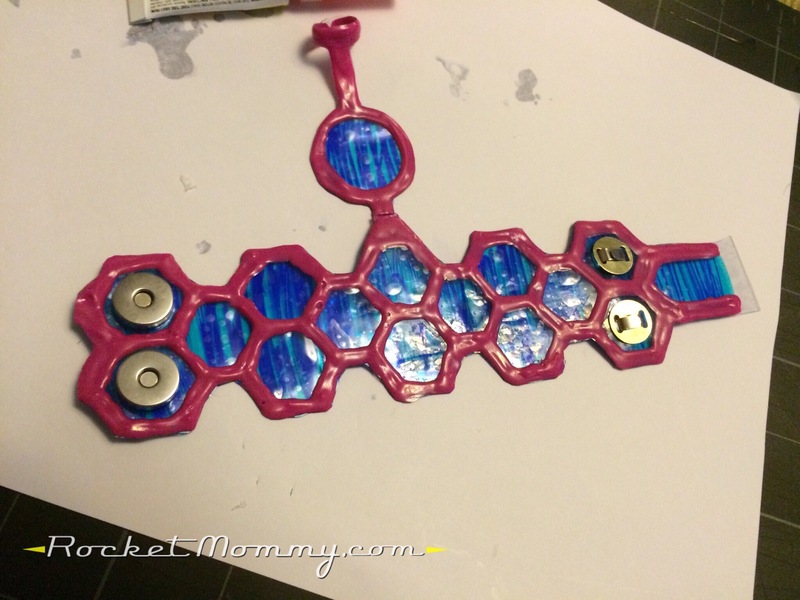 The vinyl won’t melt, but it will fuse all of the layers together very well. You’ll probably get a few little air bubbles – if you get any big ones, pop them with a needle, try and work some of the air out, and then hit it with the iron again for a bit. Now, you’ll need a bottle of this stuff: Tulip Dimensional Fabric Paint 1.25oz Slick Poppin Purple . The 1.25oz bottle in the link will be plenty – I grabbed the 4oz bottle and it was waaaaaaaay too much. I can probably make 20 more of these now. 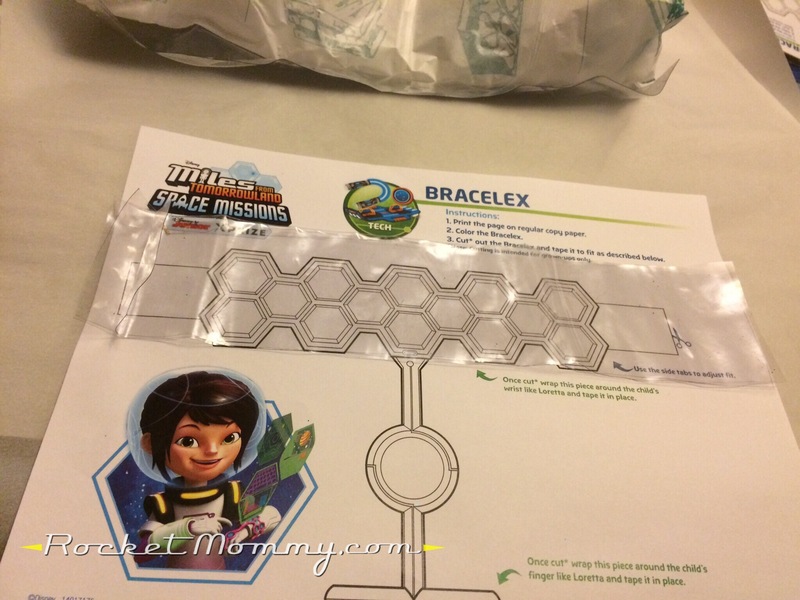 OK, so…take the colored, fused vinyl, and lay it on top of the Bracelex printout. 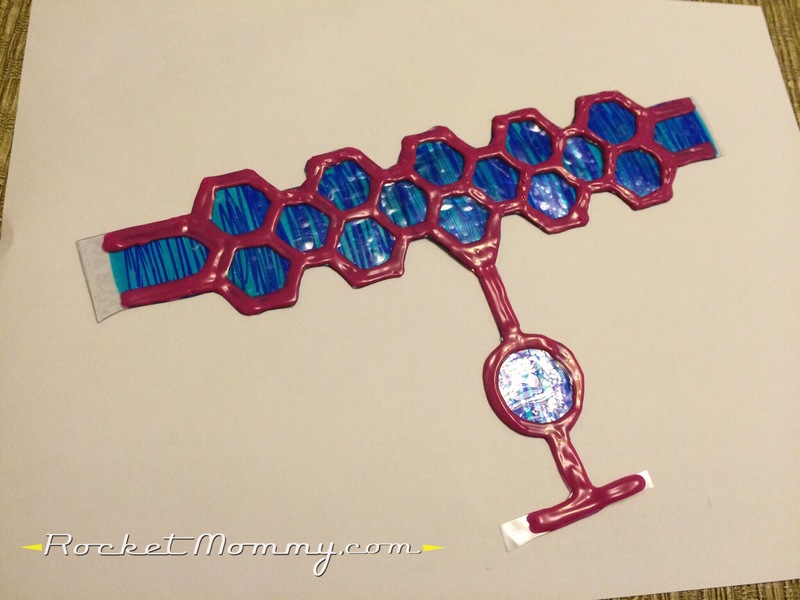 Then take the fabric paint and carefully trace the hexagonal shapes with it. Fill the lines in with the paint. Go slowly, and keep your hand steady. When you’re done, this is what it will look like. Set it aside (out of the reach of children and pets) and let it dry for at least 24 hours. Once you’re certain that it’s dry, cut around the edges of the paint. 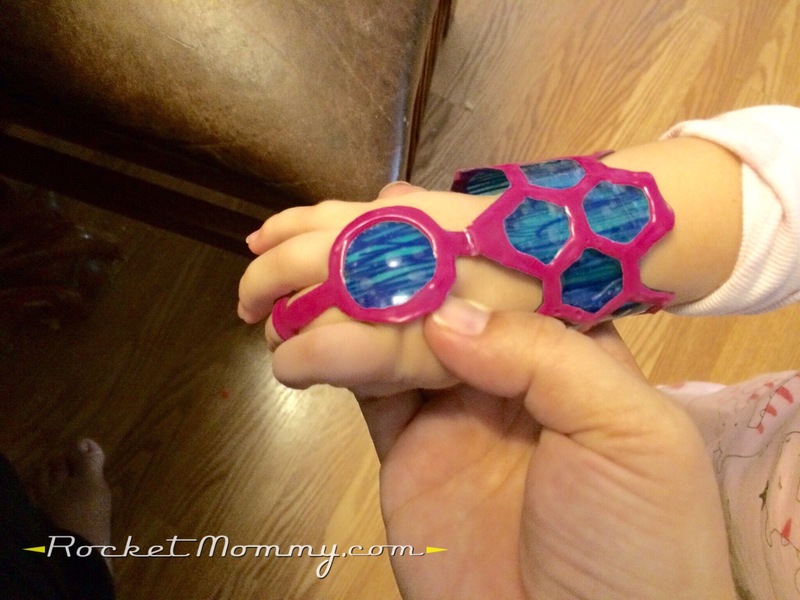 At this point I went ahead and tried it on my daughter and discovered that the piece that sticks out over the back of the hand is too long for her dainty little toddler hand. That probably would have been a good thing to check beforehand! So I peeled off some of the fabric paint, doubled the vinyl underneath itself, and super glued it. I also super glued the finger loop. 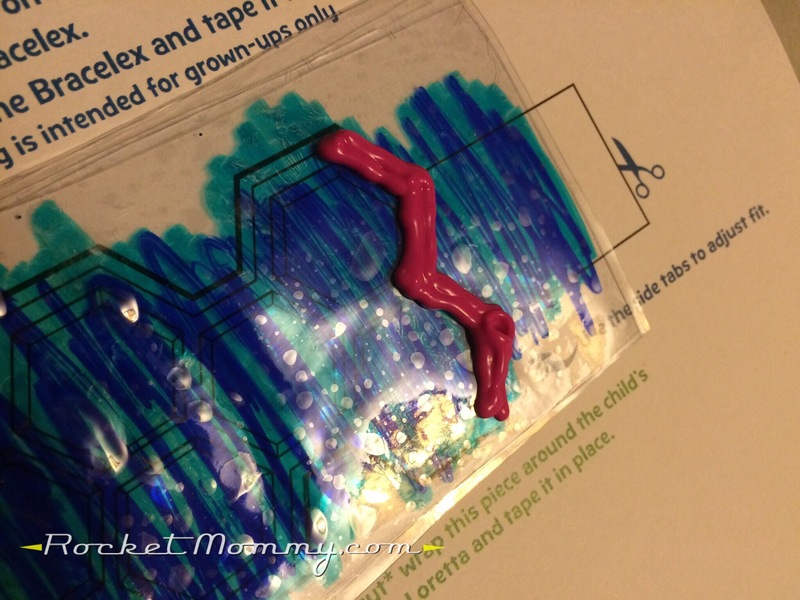 I tried hot glue first, but it doesn’t hold on vinyl at all – the super glue works great. Also, I decided to add these fasteners to the wrist piece – I had them left over from another project. They are Magnetic Snap Clasps , and they hold really well but are easy for me to undo without yanking too hard on it. 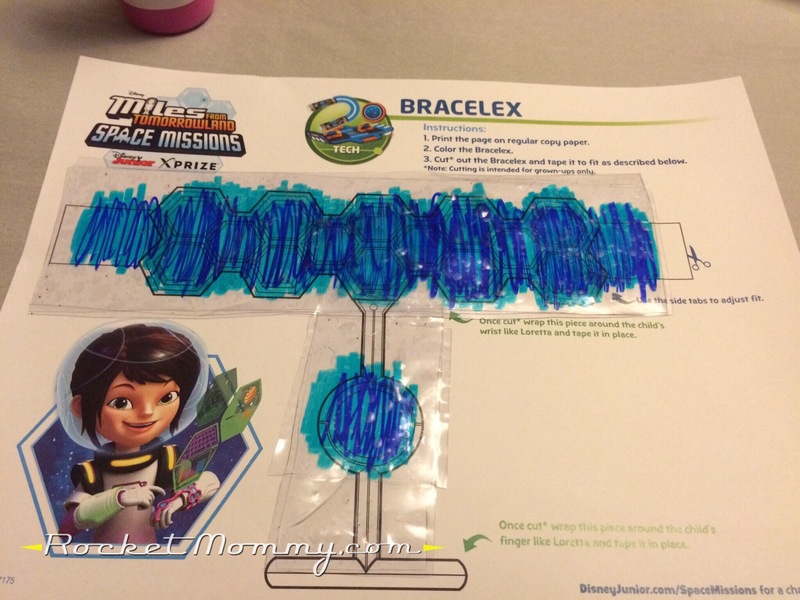 C was super excited about her new Bracelex! 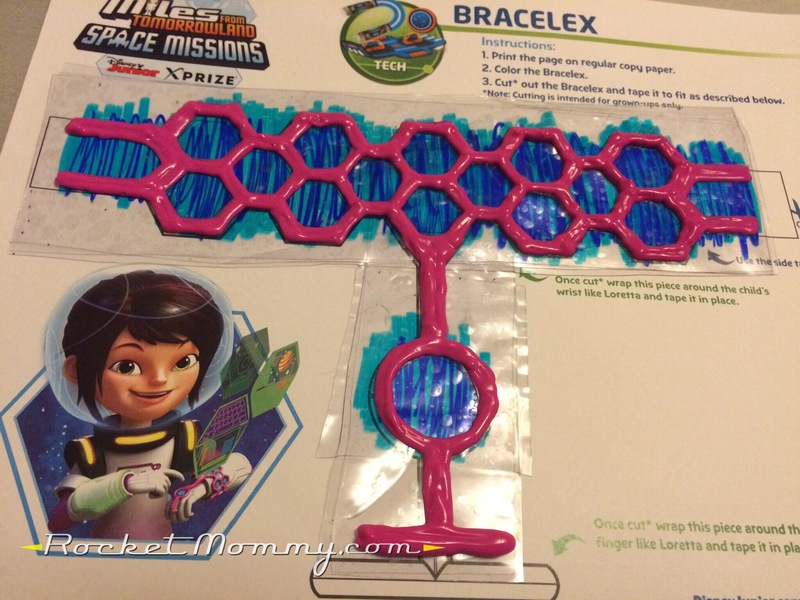 It will be the perfect addition to her Loretta costume, and it’s durable enough that she should be able to play with it for a while afterwards too. I hope this helps some of those little Loretta fans out there! Is there any way you have a copy of the bracelex pdf saved on your computer?? I went to DisneyJr to print one out & can’t find it anymore. I’m doing a DIY costume for my daughter & totally share the frustration about Loretta (her little brother is Miles – so that one was easy!). I’ll see if I can email it to you from my iPad! Good luck with the costume crafting :). You are so crafty!! So great! I am wondering if you still have the template for the t-shirt you had made? I’d love to try to get one made in time for Halloween. Thanks so much!! I have the file that I created for it, but I’d probably have to adjust it to fit whatever you’d want to use to print a shirt – I wouldn’t recommend ordering through CowCow at this point because it’ll never ship in time for Halloween. Let’s discuss further via email and see if there’s something I can do to help! The Loretta t 🙂 Thanks! 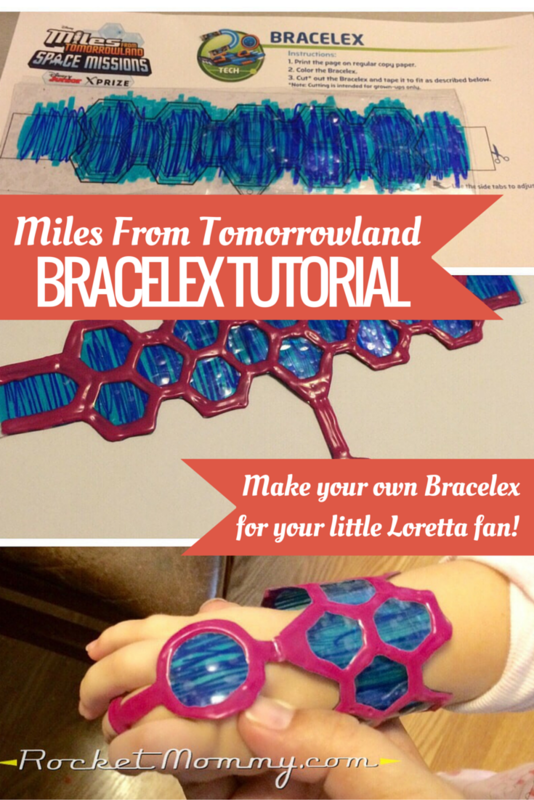 could you email me loretta’s bracelex pattern? my granddaughter loves loretta and we are sewing a costume and this would finish it out! i have looked on disney jr and could not find it anywhere. The link in the post still takes me to the file on the Disney Junior site, but I’m happy to send a copy along to you via email if that helps! Good luck with the costume! You are very creative. How lucky your children are for the fun times you provide. Disney site and can not find it. Any chance you can pass it on to me for my granddaughter? 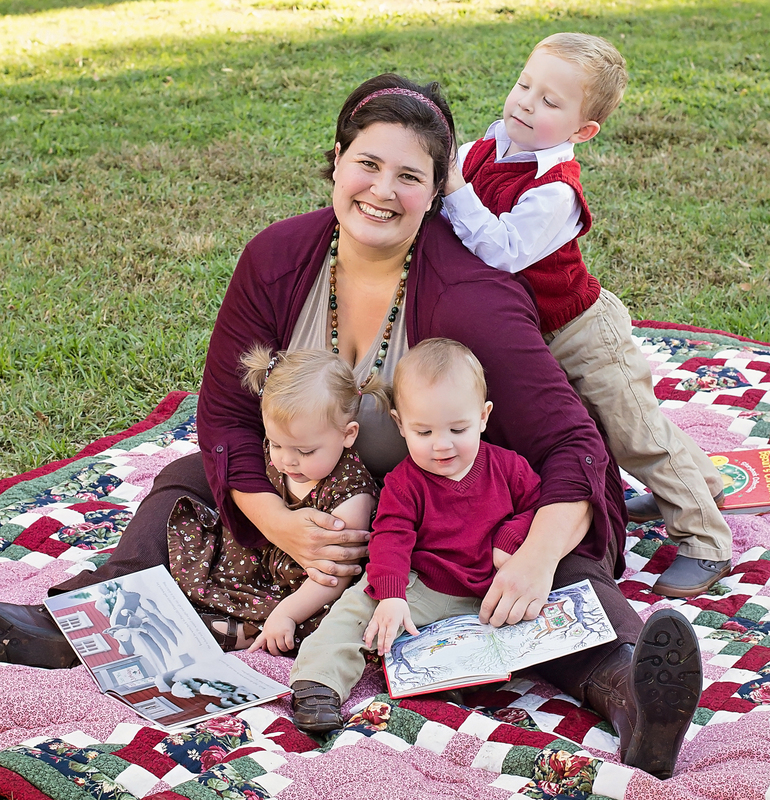 Last year we had to make Owlette which became a family affair project. Loretta this year. Can’t wait to make the helmet. Ordered the lights and going for the container today. I just tried the link in the post and it looks like the Disney website may have taken it down. I’ll email you a copy of the PDF!